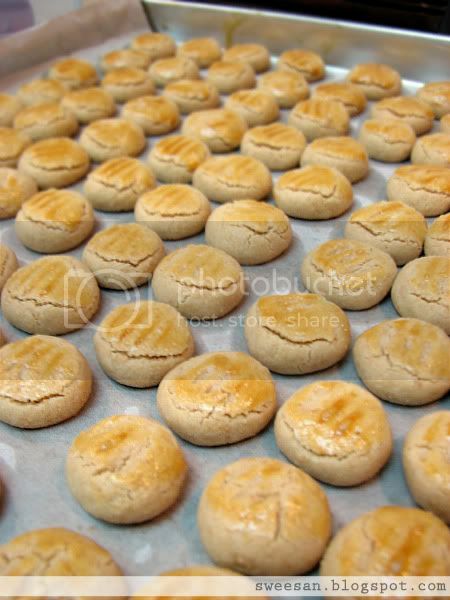 Apart from Kuih Bangkit, peanut cookies are my favourite cookie during the CNY period. I love the melt-in-your mouth but not too sticky type. Sometimes the cookie is so “thick” it gets stuck at your throat. lol.These Peanut cookies are similar to the green pea cookies but because peanut itself is oilier than green peas, the amount of oil used is lesser than the green pea cookies. Roast peanuts in a 150 C oven for 15 minutes. Remove from oven and leave to cool. Meanwhile, increase temperature to 170 C.
Grind peanuts in food processor till resembles fine crumbs, the finer it is, the smoother the cookie is. But becareful as peanut is naturally oily, try to avoid over-grinding it. Mix all dry ingredients together and whisk. Make sure everything is well incorporated. Add in corn oil and mix till it resembles a dough. Measure each piece at 5g (or more if you want a bigger cookie, but I find this size is just right) Roll into balls and press top lightly with fork. Brush with egg yolk wash and bake for about 15 minutes or till brown. CNY baking!!! This is one of my favourite cookies. I love the sound of these cookies. Was wondering, can I substitute peanut butter for the peanuts?